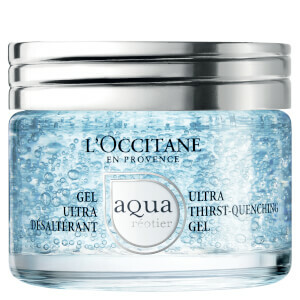 Delivering instant, long-lasting hydration, the Aqua Réotier Ultra Thirst-Quenching Cream from L'Occitane recharges skin with water to leave it feeling replenished and revitalized. Fortified with Hyaluronic Acid and Calcium-rich Réotier Spring Water (derived from the mountains of Provence), the lightweight, velvety cream locks in moisture, whilst plumping and smoothing parched skin for a younger-looking appearance. Absorbs quickly to promote a radiant, refreshed complexion with a luminous glow. Apply morning and evening in a light, tapping motion on the entire face, avoiding the eye area. Aqua/Water, Octyldodecanol, Glycerin, Propanediol, Coco-caprylate/Caprate, Corn Starch Modified, Hydroxyethyl Acrylate/Sodium Acryloyldimethyl Taurate Copolymer, Helianthus Annuus (Sunflower) Seed Oil, Sodium Hyaluronate, Arachidyl Alcohol, Behenyl Alcohol, Xylitylglucoside, Anhydroxylitol, Arachidyl Glucoside, Ethylhexylglycerin, Xylitol, Disodium EDTA, Xanthan Gum, Sorbitan Isostearate, Polysorbate 60, Sodium Hydroxide, Citric Acid, Tocopherol, Phenoxyethanol, Sodium Benzoate, Parfum/Fragrance, Linalool, Hexyl Cinnamal, Citronellol, Geraniol, Citral, CI 42090/Blue 1.